As Pakistanis honor the memory of their 1965 war heroes on Defense of Pakistan Day today, let us review some snippets of how the war looked from the other side. R.D. Pradhan and Harbakhsh Singh were both insiders who participated in the 1965 India-Pakistan war. While Pradhan was a civilian working for Indian Defense Minister Y.B. Chavan, General Harbakhash Singh was commanding Indian troops on the front-lines. Both have written books drawing upon their first-hand knowledge of how the war started, unfolded and ended in September, 1965. "On learning that, Lt. Gen. Harbakash Singh and the corps commander drove in a Jonga (Nissan P60 Jeep) to the battlefront. Army commander found that the enemy (PAF) air attack had created a havoc on G.T. Road. (Indian) Vehicles were burning and several vehicles of 15 Division abandoned on the road, the drivers having run away, leaving some of the engines still running. Maj. Gen. Niranjan Prasad was hiding in a recently irrigated sugar cane field. As described by Harabakash Singh: "He (Prasad) came out to receive us, with his boots covered with wet mud. He had no head cover, nor was he wearing any badges of his rank. He had stubble on his face, not having shaved." Seeing him in such a stage, Harbakhash Singh asked him: "Whether he was the General Officer commanding a division or a coolie? Why had he removed badges of rank and not shaved? Niranjan Prasad had no answer." Chapter 12 of Pradhan's book is titled "Retreat to Beas" in which there is detailed discussion of Indian COAS's proposal for the Indian Army to retreat behind Beas in the face of Pakistan's fierce counter-attacks after India's attempted incursion in Lahore. Pradhan argues in this chapter that during the 1965 war with Pakistan, Indian COAS General Chaudhuri feared that "a major battle the west of the Beas would end in the destruction of the Indian Army and thereafter allow the enemy (Pakistani) forces to push to the gates of Delhi without much resistance". Had a very hard day on all fronts. Very fierce counter-attacks mounted and we are required to withdraw in Kasur area. COAS was somewhat uncertain of himself. I suggested to him that he should go in forward areas so that he will be in touch of realities. He said he would go next day. In Line of Duty: A Soldier Remembers, according to Shekhar Gupta, the editor of Indian Express, Lt Gen Harbakhsh Singh reveals that not only "did Gen Chowdhury play a very small role in the entire campaign, he was so nervous as to be on the verge of losing half of Punjab to Pakistan, including the city of Amritsar. Harbakhsh describes, in clinical detail, how our own offensive in the Lahore sector had come unhinged. The general commanding the division on Ichchogil canal fled in panic, leaving his jeep, its wireless running and the briefcase containing sensitive documents that were then routinely read on Radio Pakistan during the war. Singh wanted to court martial him, Chowdhury let him get away with resignation". According to Shekhar Gupta, Harbkhash Singh recounts that a bigger disaster struck a bit to the south where the other division cracked up in assault, just as it encountered a bit of resistance. Several infantry battalions, short on battle inoculation, deserted and Singh gives a hair-raising account – and confirmation of a long-debated rumor – that Chowdhury panicked so badly he ordered him to withdraw to a new defensive line behind the Beas, thereby conceding half of Punjab to Pakistan. Singh describes the conversation with Chowdhury at Ambala where he refused to carry out the order, asking his chief to either put it down in writing or visit the front and take charge of the battle. "There is a smell of death in the burning Pakistan sun. For it was here that India's attacking forces came to a dead stop. "During the night they threw in every reinforcement they could find. But wave after wave of attacks were repulsed by the Pakistanis"
"India", said the London Daily Times, "is being soundly beaten by a nation which is outnumbered by four and a half to one in population and three to one in size of armed forces." "Who can defeat a nation which knows how to play hide and seek with death". "For the PAF, the 1965 war was as climatic as the Israeli victory over the Arabs in 1967. A further similarity was that Indian air power had an approximately 5:1 numerical superiority at the start of the conflict. Unlike the Middle East conflict, the Pakistani air victory was achieved to a large degree by air-to-air combat rather than on ground. But it was as absolute as that attained by Israel. "The ball is now in the political court again--where it should be--and not in the military one. I hope we have the vision and courage to (our) political leadership." Alas, the core issue of Kashmir still remains unresolved 47 years since Mr. Chavan wrote his words of wisdom. "Pakistan has been able to gain complete command of the air by literally knocking the Indian planes out of the skies if they had not already run away. Indian pilots are inferior to Pakistan's pilots and Indian officer's leadership has been generally deplorable. India is being soundly beaten by a nation which is outnumbered by a four and half to one in population and three to one in size of armed forces". Peter Preston, The Guardian, London. "One thing I am convinced of is that Pakistan morally and even physically won the air battle against immense odds. Although the Air Force gladly gives most credit to the Army, this is perhaps over-generous. India with roughly five times greater air power, expected an easy air superiority. Her total failure to attain it may be seen retrospectively as a vital, possibly the most vital, factor of the whole conflict. Nur Khan is an alert, incisive man of 41, who seems even less. For six years until July he was on secondment and responsible for running Pakistan civil airline, which in a country, where now means sometime and sometime means never, is a model of efficiency. He talks without the jargon of a press relations officer. He does not quibble about figures, immediately one has confidence in what he says. His estimates proffered diffidently, but with as much photographic evidence as possible, speak for themselves. Indian and Pakistani losses, he thinks are in something like the ratio of ten to one. "The Indians had no sense of purpose, the Pakistanis were defending their country and willingly taking greater risks. The average bomber crew flew 15 to 20 sorties. My difficulty was restraining them, not pushing them on".
" This is more than nationalistic pride. Talk to the pilots themselves, and you get the same intense story". Patrick Seale, The Observer, London. "Pakistan's success in the air means that she had been able to deploy her relatively small army___ professionally among the best in Asia___ with impunity, plugging gaps in the long front in the face of each Indian thrust. By all accounts the courage displayed by the PAF pilots is reminiscent of the bravery of the few young and dedicated pilots who saved this country from Nazi invaders in the critical Battle of Britain during the last war". "I have been a journalist now for 20 years and want to go on record that i have never seen a more confident and victorious groups of soldiers than those fighting for Pakistan right now. "India is claiming all out victory, i have not been able to find any trace of it. All i can see are troops, tanks and other war material rolling in a steady stream towards the front. If the Indian Air Force is so victorious, why has it not tried to halt this flow? The answer is that it has been knocked from the skies by Pakistani planes. These Muslims of Pakistan are natural fighters and they ask for no quarter and they give none. In any war, such as the one going on between India and Pakistan right now, the propaganda claims on either side are likely to be startling, but if i have to take bet today, my money would be on Pakistan side. Pakistan claims to have destroyed something like one third of the Indian Air Force, and foreign observers, who are in a position to know say that the actual kills may be even higher, but the PAF authorities are being scrupulously honest in evaluating these claims. They are crediting PAF only those killing that can be checked and verified from other sources. Pakistan's soft belly in Panjab and Sindh is difficult to defend against 7-10 times larger army. So in 1965, if an Indian general was talking about retreating to Beas, things had clearly gone wrong, very wrong for the Indian army. The credit for this goes to the superior Pak Air force, and high morale of the troops. Indian troops have invaded West Pakistan, crossing the border at three points in an attack which appears to be aimed mainly at the city of Lahore. Authorities in Delhi say their action was intended to prevent a direct attack by Pakistani forces against India. On 25 August, Pakistani soldiers launched a covert operation across the ceasefire line, established in 1949 after the first Indo-Pakistani war, into Indian-administered Jammu and Kashmir. Since then there have been a number of clashes along the ceasefire line, but this is the first time Indian troops have crossed into West Pakistan in what is being seen as an act of war. 2.Indian counterattack pointed at Lahore and Sialkot. 1.Kashmir is still with India. 2.Begining of the end of PAkistani economic boom. The purpose of this post is to prove (if at all it can be called as proof) that Pak army is superior to Indian army. Fine let us assume that it is true. Now the big question is, why a country with a superior army can not get Kashmir for 65 years despite claiming that to be central point of their agenda in any talks with India. India never claims that any talks with Pakistan must include POK in the agenda because we don't need it. So, why Pak can not get one inch of Kashmir. This is no different from Israel surrounded by 6 enemy countries and still holding on to it and also being one of the most developed country of that area. The defeat in the 1965 war led to the army's invincibility being challenged by an increasingly vocal opposition. This became a surge after his protege, Zulfikar Ali Bhutto, deserted him and established the Pakistan People's Party. India's strategic aims were modest – it aimed to deny Pakistani Army victory, although it ended up in possession of 720 square miles (1,900 km2) of Pakistani territory for the loss of just 220 square miles (570 km2) of its own. While we celebrate our brave Army and our world's best Air force, I think we should also take a moment to recognize the dedication and hard work of the brilliant people at our Pakistan Bureau of Statistics. 1) Bangladesh's Government has been running fiscal (budgetary) deficits from 1990-2012. 2) India's Government has also been running fiscal (budgetary) deficits from 1990-2012. 3) Our Government, however, has been running huge fiscal (budgetary) SURPLUSES for much of the period from 1990 to 2012. The whole world is impressed with our outstanding performance. To quote British media on India vs Pakistan is pretty much the same as to quote Pakistani newspapers! You must remember that Britain lives to justify its imperial past and hence to insult and jeer India is the most core part of their national identity. As yet another Indian rocket blasted into space today, with French and Japanese payloads on board, Britain and Pakistan can only bite their nails and shake their fists. Well...at least you two sister states: Britain and Pakistan have each others shoulders to cry on. Today the west is anti islam so cartoonishly pro India. Quoting British newspapers is the same as us quoting Pravda! 1.Objective of gaining Kashmir FAILED. 3. Radicalization of society started soon afterwards. 4.Bhutto gained power which would prove to be weepingly expensive in 1971. 5. Convinced a certain Mrs. G (then a newcomer) that Pakistan needs to be 'sorted out' which she did in 1971. The Difa Pakistan Council often insists that we should not trade with India because of its evil intentions towards our country. Even beyond the DPC, there is a general feeling in our country that we should focus our local trade toward these three friendly countries (i.e. China, Iran & Afghanistan) rather than focus on India. But are China, Iran & Afghanistan really neighboring countries? What do you think, Dr. Haq? Is China really our neighboring country or is it more an East-Asian country neighboring Taiwan, Korea, Japan, Vietnam et cetera? Is Iran really our neighboring country or is it more an West-Asian country neighboring Iraq, Syria, Turkey et cetera? Is Afghanistan really our neighboring country or is it more a figment of somebody's imagination since it barely shows up on the satellite image linked above? HWJ: "What is your opinion on all this?" There's a Pew Survey out today that says 64% of Indians and 64% of Pakistanis want to trade with each other...and I agree with them with a few caveats I expressed in my blog post on the subject. It is strange that Gen Harbakhsh is criticizing both his junior and his Chief of Army Staff. What is he trying to prove? Gen Niranjan Parsad led his Division from the front. He risking his life was at BRBL home bank while Harbkhsh was sitting at Amritsar. Gen Niranjan rightly assessed the impregnability of BRBL and advised his Corps Commander to not reinforce failed attack along G T Road but Harbakhsh Singh wanted to please his Chief Of Army Staff who wanted to dine at LAHORE GYMKHANA. Perhaps it was Harbakhsh and not Niranjan Parsad who lacked guts a moral courage to give true battle assessment to his seniors. Shahzad: "I believe him that he will end corruption in 90 days... I think it can be done sooner if the person on the top is not corrupt.."
Indian PM Manmohan Singh is widely believed to be Mr. Clean. And Yet, Indian politicians and bureaucrats are among the most corrupt in the world. If the person on top really mattered so much, India would be free of corruption. Shahzad: "He was making a general point afterwards that if he comes out too strongly against the Taliban after every act of violence by them and starts a confrontation with them, he will put his workers in jeopardy who will then be targeted by the Taliban." It takes a lot of courage to deal with the killers when you have to risk your own life to do so. If political courage to stand up to to the Taliban killers is an important standard by which to judge politicians, then Imran does not look very good when compared with ANP, PPP and MQM leaders. As Imran himself pointed out, the ANP members have paid a huge price with their lives for standing up to the Talibs...something Imran is unwilling to do. Since the first Indo-Pakistan war, both countries have continued to lay claim to the entire state of Kashmir. Currently Pakistan controls the smaller, northern sector of Azad Kashmir and the remaining area of Jammu and Kashmir, known commonly as Kashmir, is held by India. Details of today's invasion are sketchy. There have been reports of the Indian Air Force in action, striking against military targets, including an oil tanker train, a group of military vehicles, a goods train carrying supplies, an army camp and some gun positions. A spokesman for the Indian government said: "Our policy is that when Pakistan has bases from which it is mounting attacks on our territory we have to destroy those bases." The Defence Minister Yashwantrao Chavan blamed recent attacks by Pakistani forces for the invasion. Although there have been a number of air attacks against Indian installations in Punjab, these seem to have been mostly by single aircraft. But Mr Chavan said: "It was quite apparent Pakistan's next move was to attack Punjab across the international frontier." Reports from the Pakistani city of Karachi say forces have beaten back the Indian Army from Lahore. They said advances at the border towns of Jasar, Wagah and Bedian had all been "fully stopped". Pakistani officials say the number of Indian dead in the Lahore sector is 800, their own casualties are reported to be "very light". The Pakistani President Ayub Khan has made an emergency broadcast to the nation saying, "We are at war". He said the Indian attack was proof of the evil intentions which India had always harboured against Pakistan. Reports from Delhi say Pakistani paratroopers have landed in the Punjab. Small groups have dropped in three places, Pathankot, Patiala and Ambala in an apparent attempt to damage military installations. 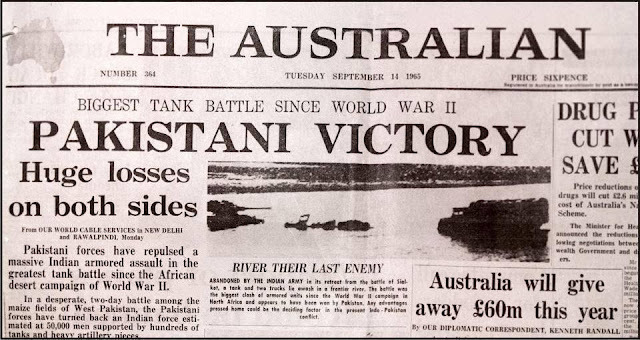 Of Course Pakistan Won The War in 1965.Why Else Would Soviet Union Intervene.They Were Friends of India Not Pakistan and Besides Indians We Lost Because We Failed To Capture Kashmir Then The Same Question Can Be Asked To Them.They Claim The Entire Disputed Territory,If They Were So Comprehensively Winning The War Then Why Didn't They Capture It?? One of the most glorious moments of the Indian Army, the victory in the Battle of Longewala in the 1971 war with Pakistan, is based on blatant falsehood, claims an upcoming book by a general decorated in the same operations. The battle was immortalised by the 1997 Bollywood blockbuster "Border", starring Sunny Deol as victorious army hero major Kuldip Singh Chandpuri. In a tell-all account of one of the first engagements in the western sector during the 14-day war, major general Atma Singh (retd) has alleged that the army's version of the battle is built on "exaggerated claims" when it had little to do with crushing Pakistani forces. Arun Jaitley thumps his chest and proclaims that we have given the Pakis a "jaw-breaking reply" (munh tod jawab). Oh yeah? The Pakistanis are still there - with their jaw quite intact and a nuclear arsenal nestling in their pockets. Rajnath Singh adds that the Pakis had best understand that "a new era has dawned". How? Is retaliatory fire a BJP innovation? Or is it that we have we ceased being peace-loving and become a war-mongering nation? And Modi thunders that his guns will do the talking (boli nahin, goli). Yes - and for how long? When a young band of Serbian terrorists slipped into Bosnia to kill Archduke Franz Ferdinand, the Government of Serbia did not know, even as it is entirely likely that the Government of Pakistan did not know that Ajmal Kasab and his gang had slipped into Mumbai to target the iconic Taj Hotel. But, as in India, so in Austria, the suspicion was so strong that there were rogue elements in the Serbian establishment that were backing the terrorists, no proof was needed: suspicion amounted to conviction. Therefore, when the Serbian terrorists struck, assassinating the heir-apparent to the Austro-Hungarian throne, the Empire needed no conclusive proof that the Serbian government was behind the assassination. It knew, as India "knew", that 26/11 was master-minded by the Government of Pakistan. And even as the Pakistan government denied any involvement in such cross-border terrorism and undertook to set in train an investigation into the dastardly terrorist attack, so also, a hundred years earlier, did Serbia condemn the assassination and offer to investigate and bring to justice those responsible. But Vienna would not be appeased. An eight-point ultimatum was sent to Serbia demanding full acceptance of the eight conditions within a month. Eventually, after much hemming and hawing, Belgrade accepted seven of the conditions but baulked at the eighth - that a joint Austrian-Serbian investigation be launched into the assassination. That was enough for Vienna to insist that if all conditions were not fulfilled, the far more powerful Austro-Hungarian forces would reduce Serbia to rubble in a matter of days. The threat was meant to cow the Serbians. The Serbians went as far as they could, but baulked at abject surrender. In consequence, military plans began to roll - to the alarm of both Emperor Franz Joseph of Austro-Hungary as well as the German Kaiser whose belligerence was pushing Vienna further and further down the road to disaster. Their political misgivings were entirely understandable. For Russia had declared that any military action against her Slav cousin would invite Russian retaliation against both Austria and Germany. At the same time, Germany had made it clear that her first target was France. Treaty obligations made it incumbent for France to come to Russia's rescue and vice versa in the event of war. Britain was committed to entering the war in these circumstances. The very balance of power that was supposed to have kept the peace in Europe for a hundred years was now pushing the world to the brink. They were closing in rapidly and there was no choice, but to turn and engage. No sooner had the leader ordered the turn, that the radio and radar signals were jammed, emitting unbearably shrilly noises. Just as I was turning to position myself during the turn, I got a glint of metal from behind and well below me. I simply could not ignore it and turned back to find two Mirages zooming up towards me from the valley beneath. By this time, my own formation had turned 180 degrees away flying at Mach 1.2 with no radio contact. ‘This was it’, I knew instinctively, and I was alone: Two Mirages against a single Mig-21. Instantly the fighter pilot’s training kicked in and all other thoughts left my mind. I proceeded to do what I had been trained to do. A cardinal rule of air combat is knowing and using the limitations and strengths of your own and the enemy’s aircraft. A Mirage is good at high speeds and poor at slow speed combat. The Mirage leader made his high speed pass at me and as I forced him to overshoot he pulled up high above me. His wingman followed in the attack and I did the same with him; followed by a violent reversal and making the aircraft stand on its tail. The speed dropped to zero. The wingman should have followed his leader. To my surprise he didn’t, and reversed getting into scissors with me at low speeds. That was suicidal and a Mirage should never do that against a Mig-21. But then, the game plan probably was for the wingman to keep me engaged while the leader turned around to sandwich and then shoot me. It was a good plan, but not easy to execute. The only difficulty in this plan was that the second Mirage had to keep me engaged long enough without becoming vulnerable himself. This is where things began to go wrong for the wingman because his leader took about 10 seconds longer than what was required. The wingman couldn’t just hang on with me and there was a star of David in my aiming sight after the second reversal. Seeing his dilemma and desperation to escape, the wingman attempted an exit with a steep high-speed dive. That in fact made my job easier and quicker. As soon as the distance increased and I heard the deep growl of the K-13, I fired. The missile takes one second to leave the rails and that was the longest second of my life. A second later there was a ball of fire where the wingman had been and I turned to face the leader charging towards me. We crossed but he had made a beeline for his home and thank God for that. I had only vapours remaining and no fuel. I hit the deck with supersonic speed. Capt Lutz who was flying as the unfortunate wingman, was rescued by a helicopter and brought to the military hospital. He succumbed to his injuries later in the hospital before I could have a tete-a-tete with him. I have his flying coverall with me, presented to me as a war trophy by the Syrian air force commander-in-chief. I was awarded Wisam-e Faris and Wisam-e-Shujaat by the Syrian government, which are equivalent to Pakistani Hilal-e-Jurat and Sitara-e-Jurat. In 1965 war, Indian Army had captured the strategic Haji Pir Pass. During the Tashkent talks between Indian and Pakistan, held through the good offices of Soviet Union, India agreed to return Haji Pir Pass, Pt 13620 which dominated Kargil town and many other tactically important areas. To add myster ..
One- had the pass been held by us, the distance from Jammu to Srinagar through Poonch and Uri would have been reduced by over 200 Kms. Two – later on Pak commenced its infiltration into J & K in 1965, through the Uri – Poonch Bulge which continues even today. They why did we commit this error of judgement?